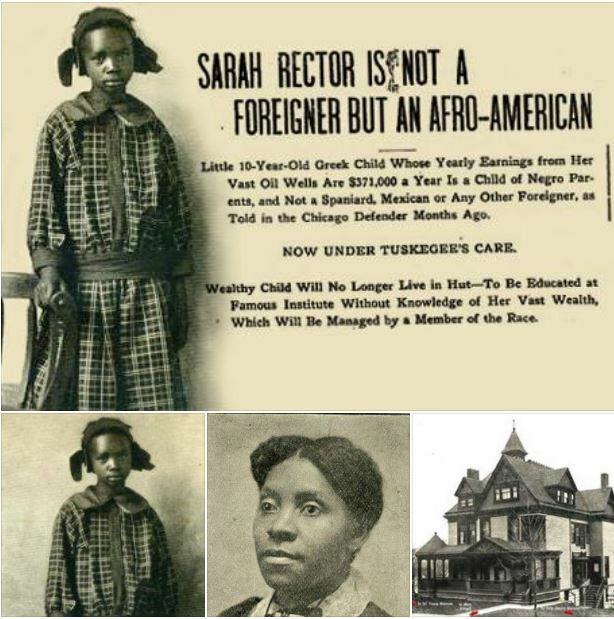 Sarah Rector was born in 1902 near the all-black town of Taft, located in the eastern portion of Oklahoma, then an Indian Territory. She had five siblings. Her parents, Joseph Rector and his wife, Rose McQueen were African descendants of the Creek Nation Creek Indians before the Civil war and which became part of the Creek Nation after the Treaty of 1866. Using the Dawes act (an act meant to “tame” the native people) native lands were divided into parcels meaning that Sarah’s family was given a parcel of land considered to be inferior for farming or nearly anything else. In an effort to pay the $30 annual property tax Sarah’s father lease part of the land to Standard Oil. In 1913, the independent oil driller B.B. Jones drilled a well on the property which produced a “gusher” that began to bring in 2,500 barrels of oil a day. Rector began to receive a daily income of $300 from this strike. The law at the time required full-blooded Indians, black adults, and children who were citizens of Indian Territory with significant property and money, to be assigned “well-respected” white guardians. In October 1913, Rector received royalties of $11,567. Rumors began to fly that she was a white immigrant who was being kept in poverty. The newspaper published an article claiming that her estate was being mismanaged by her and her “ignorant” parents and that she was uneducated, dressed in rags, and lived in an unsanitary shanty. National African American leaders such as Booker T. Washington and W. E. B. DuBois became concerned about her welfare. In June of that year, a special agent for the National Association for the Advancement of Colored People (NAACP), James C. Waters Jr, sent a memo to Dubois regarding her situation. Waters had been corresponding with the Bureau of Indian Affairs and the United States Children’s Bureau over concerns regarding the mismanagement of Rector’s estate. To combat this practice of white guardianship W. E. B. DuBois establish a Children’s Department of the NAACP, which would investigate claims of white guardians who were suspected of depriving black children of their land and wealth. Booker T. Washington also intervened to help the Rector family. Sarah and her siblings attended school in Taft the family lived in a modern five-room cottage, and they owned an automobile. In October of that year, she was enrolled in the Children’s School, a boarding school for teenagers at the Tuskegee Institute in Alabama, headed by Washington. Upon graduation, she attended the Institute. Rector was already a millionaire by the time she had turned 18. She owned stocks and bonds, a boarding house, a bakery and restaurant in Muskogee, Oklahoma, as well as 2,000 acres of prime river bottomland. Rector lived a comfortable life, enjoying her wealth. She had a taste for fine clothing and fast cars. She was frequently ticketed by the police of the city for speeding she will say to officers, “Do you know who I am?” which apparently worked. She hosted frequent gatherings at her home for the leading members of the nation’s African American community, entertaining the likes of Count Basie and Duke Ellington. In the depression, like many wealthy Americans, she lost the majority of her wealth she lived comfortably dying on July 22, 1967, at the age of 65.